Does your hair need help? Mine sure does! My hair is very long and is dry and damaged from both heat styling and highlights. I absolutely rely on my hair care products to keep my hair looking shiny and healthy. Finding the right products can absolutely make the difference with how your hair looks and feels. So, it always thrills me when I find a product that really transforms my hair! I have found this in Ecru's amazing Acacia Protein Oil!!! Plus, I always love a product that reduces blow dry time!!! Ecru's entire hair care line is centered around the use of Silk Proteins. Silk Proteins are created by the hydrolysis of silk fibers. While silk proteins are traditionally a skincare ingredient, Ecru has found that silk proteins make a tremendous impact with the hair! The Silk Proteins for a protective film around the hair cuticle that protects the hair and prevents further damage while also increasing elasticity and shine. 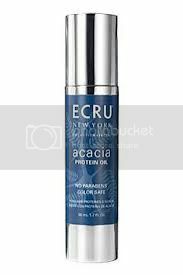 Ecru's NEW Acacia Protein Oil is my introduction to this line. So far, I must say that I am completely impressed! The NEW ECRU New York, Acacia Oil is an ultra-light, multi-functional styling and treatment oil formulated with patented Acacia Collagen™ is a miracle worker in a bottle which provides superb conditioning and moisturization instantly. First of all, the packaging is totally beautiful! There is no question that this is a high end brand. The Acacia Oil comes in a sleek pump container with a pretty blue design and silver accents. The pump is easy to control to dispense just the right amount of product with no leakage or product waste. 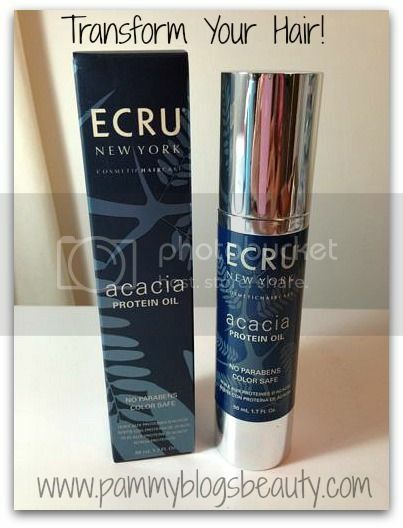 Ecru's Acacia Protein Oil is versatile! You can use this product wet or dry! After towel drying my hair, I distribute a small amount (about 2-3 pumps) to my hair. Note: My hair is very long. So, judge how much to use depending on the length and thickness of your hair. Then I style as usual. When my hair is completely dry and styled. I "finish" my hair with "just a touch" of this oil on the ends. Dry application smooths it down further and creates amazing shine! Acacia Collagen™: a patented plant-based collagen that moisturizes hair and improves the hair’s ability to retain that moisture. Argan Oils: To soften and smooth the hair, giving it that silky feel. After using Ecru's Acacia Oil, my hair is left feeling soft and silky and looking shiny, healthy, and smooth. All of this without any greasy feel. I just love it! When I use it, my hair feels protected from blow drying with a round brush. My brush glides through my hair easier and I do feel that my blow dry time is slightly reduced. Overall, this product is a big winner!!! I love Ecru's NEW Acacia Oil and I can't wait to explore this line further and test out more products in the future!!! Nice review, product sounds great!